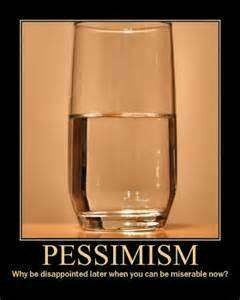 FIRST – When you think of the word "pessimism," what is the first thing that pops into your mind? 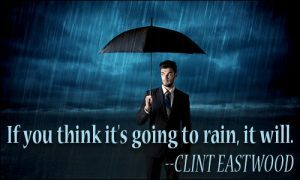 How about the combination of words, "Positive Pessimism?" Is that an oxymoron? Before I continue, I need to issue a warning. This concept is highly advanced. Most people won't understand. Others might even be disturbed. To quote a favorite movie, "So be it." The last two days I posted about the "Law of Detraction" – a play on words to describe my POV on the so-called "Law of Attraction." Today's topic is "Positive Pessimism." For the past few weeks I've been immersed in the concept of "Positive Pessimism." Before you go out and try to find that term defined anywhere else, let me say that I doubt you will. Certainly it would be surprising, especially if it has any reference whatsoever to my definition/perception. (If so, then maybe there's a kindred spirit for me out there. Or perhaps it's another monkey starting to to add to 100. Hmmm… that would be interesting). If you're into self-development at all, I suspect you're barraged with messages about the "power of positive thinking." The need to "look on the bright side" because "you are what you think" and/or "you create your own reality." Some even think optimism is "the secret" to success and happiness. So what about pessimism? Does it deserve the bad rap it gets? Are all pessimists "Debbie Downers?" When you see this quote – what thoughts go through your mind? Is it suggesting that your thoughts created the rain? Is it your impression that this is a BAD THING? Let me turn that on its head. First of all, as I said above, what I'm going to share with you is an advanced concept. Waaaay beyond "The Secret." Even beyond the concepts in my "Five Reasons Why Bad Things Happen" book which provides ample evidence for the impact of thoughts (conscious and subconscious) on what happens in our lives. After all, Subconscious Sabotage is one of the "Reasons Why." But I never ever ever said that it's the "only" Reason Why" bad – or good – things happen. There are SO many other factors, most of which have a lot more to do with destiny and life purpose than simply the thoughts floating through your head while you're hear. Said another way – I do NOT believe "you create your own reality." I DO believe you "co-create your reality." If you're here to bask in happiness and joy and positive thoughts and instant manifestation of all your heart desires, good for you. Though I will say that with a bit of a sneer. Not because I don't also aspire to happiness and joy and positivity and instant manifestation, but because I don't think that's why you – or I – are here. We're hear to learn and grow and contribute, and that rarely if ever happens in a lifetime of pure positivity and joy. As my children's book says, "For life isn't easy, and not always fun; but easy is boring, like games always won." I have a friend to whom things come easily. If he wants something, he gets it, almost like snapping his fingers. Things are handed to him. Imagine that. What could happen to someone who had that kind of power? To quote another movie, "With great power comes great responsibility." I guess he could've turned out like a spoiled brat, taking advantage of people to achieve selfish desires. Instead, though, he was almost paralyzed. He had a really difficult time making a decision because he had absolute certainty that if he wanted it, it would happen, and he wasn't 100% sure he wanted what he thought he wanted. What paradoxical wisdom! Now look at my life. The opposite, really. For most of my life – at least the last half of it – if I wanted something, I was practically guaranteed NOT to get it. No matter what I did – no matter how hard I tried. No matter the hours, the actions and most certainly no matter how much optimism or "happy thoughts." No matter how many books I read, no matter how many exercises (or exorcizes) I did. No change. For me, "wanting" became an obsession. Unlike my friend who was afraid to want – because he'd inevitably get it – I figured I'd try and "want" and go for a bunch of things. Why not? My chances of getting any of them was slim to nil anyway. Then the clouds cleared. I saw the "light" (or dark, if you will). I had to accept my "lot in life." Pessimism invaded. Certainty of failure pervaded. No matter what I would try, it wouldn't matter. It wouldn't happen. Stop the optimism! Stop the hopeful expectations! Stop the wanting! For a few days I struggled, asking myself, "Does that mean I stop trying?" I mean, why try if failure was guaranteed? Do I just throw in the towel completely? Then I had to accept myself for who I am. The core of my being. What I am inside. The outside might be a "failure." (At least failure to accomplish any of the goals I'd set out. Failure to have any kind of "reward" that came close to measuring up to the effort I'd exuded.) But who I am is someone who still "tries." I used to say my epitaph would read, "She tried." So if those quotes that say the only failure is in not trying, then I guess I'm a success at one thing: Trying. To steal another movie quote (from a favorite film, Before Sunrise by Richard Linklater): "I believe if there's any kind of God it wouldn't be in any of us, not you or me but just this little space in between. If there's any kind of magic in this world it must be in the attempt of understanding someone sharing something. I know, it's almost impossible to succeed but who cares really? The answer must be in the attempt." So now "positive pessimism" is my way of life. The 100% absolute certainty that no matter what I try, I will fail. But I will still try. And you know what? Something surprising has been happening. No more self-pressure to succeed has led to a kind of freedom. When we go for something, there's a hint of the fear my friend had asking, "What if it happens? What if the investors for my business come through? What if someone wants to produce my film? What if I win that award? Get that opportunity?" Here's an example. I submitted my script to a screenwriting competition. I also submitted it last year, and thought "This could be it! My opportunity to really make my mark! The opening I need!" And of course I didn't win. I didn't even get into the finals. I was crushed. At least for a few days. I didn't "not win" because I didn't have enough positive thoughts. So don't even try to suggest that. As I said, what I'm telling you here is that this lesson goes waaay beyond that elementary (and very limited) philosophy. This year I entered the contest just for the heck of it. Not just with zero expectation, but with the absolute certainty that I won't win. And you know what? I don't care. And that's freedom. The epitome of "detachment." And if attachments are our source of unhappiness, what happens when we embrace detachment? Before you say something like "hey, now things will start happening for you, now that you've 'given up!'" let me stop you right there. That is not the point. In fact, that's the anti-point. (Like if there's matter and anti-matter). If Positive Pessimism was the key to success, it wouldn't be Positive Pessimism, would it? And then it would sabotage itself. So now ask yourself: if everything you did, everything you tried was destined to fail, if everything you wanted was guaranteed to never manifest, how might that change your life and what you do every day?